1. Preheat grill to medium-high. In medium bowl, combine all ingredients except shrimp and stir well. Peel shrimp except for tail, and devein. Rinse and pat dry with paper towels. 2. Place shrimp in large resealable bag. Add marinade. Through bag, rub marinade into shrimp. Place in refrigerator for 20 minutes. Halfway through, turn bag and give shrimp another marinade massage. (Do not marinate longer then 20 minutes, or the acidic lime juice will cook the shrimp. 3. Place shrimp on cutting board and nestle them together in groups of six. 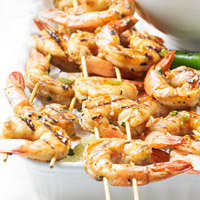 Using two bamboo sewers for each group, skewer the shrimp together (this is nice for presentation, keeps shrimp from falling into the grill, and makes them easier to turn). 4. Grill shrimp on an oiled grill rack 2 minutes per side, or until opaque. Serve with Toasted Couscous with Grilled Mango and Zucchini, see recipe. Makes 4 servings. 5. *Hot chile peppers, such as jalapeños, contain oils that can burn skin and eyes. Avoid direct contact as much as possible. Wear plastic gloves. If using bare hands, wash hands well with soap and water. Whisk together dressing and grated ginger in a large bowl. Cut avocado slices in half crosswise; gently toss with dressing mixture. 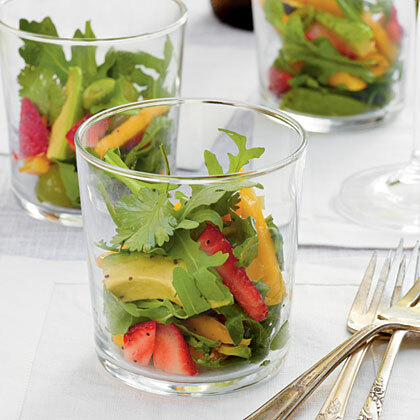 Add arugula and remaining ingredients; gently toss to coat. Serve immediately. Pair with: Tramin Gewürztraminer, Italy or Vouvray. I absolutely LOVE cilantro and lime. They are both so refreshing! We've had record breaking hot temperatures around our parts lately, so anything refreshing is a very good thing! So, what's your favorite summer fare?